I have begun to leave a lot of models folded only half-way through so I have now decided not to start off on any new designs or folding until I wrap up those. This is a model from Román Díaz’s book – #3 Origami Essence – and is tagged as a level 4 category of designs. It is slightly complex with the numerous layered folds, rabbit ears and shaping involved. There are 61 steps in all, and this includes the shaping. The model requires a lot of shaping at the end in order to give it a slightly 3D look. Hence, the paper you select for this design must be ‘flexible’ and allow for shaping without breaking / tearing apart at the edges. This is especially important because when you are at the end of the folding sequence, you will find that there are man layers that you need to fold through and tuck in, which if you have selected plain Kami or thicker variety, will make it very difficult. 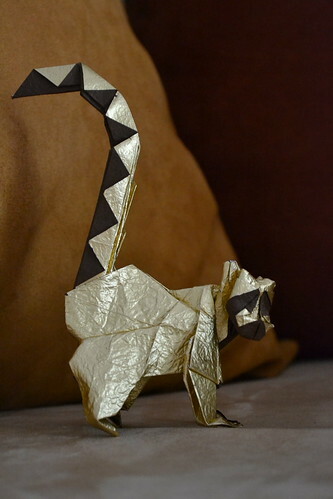 I have not wet-folded my rendition of Román Díaz’s Ring-tail Lemur. Instead, I have selected special washi paper – Deluxe Washi BROWN – 10 sheets – which I purchased from origami-shop.com. This paper is extremely ‘shapable’ and you do not need to wet-fold at all. However, errors in folding are quick to show as the gold foil on the reverse layer peels off with tension. So it’s a good idea to practice your folding before trying with this sort of paper. While Román Díaz, in his book, mentioned that this design of his can be folded with double-tissue paper which is Duo colored i.e. beige on one side and black on the other side, I have used Duo-colored deluxe washi paper which is gold foiled on one side and chocolate brown on the other side. This paper measures 35 cms square and the final model (post folding), measure approx 7 inches in height (taking into account the curling tail) and 3.5 inches across. Diagrams to this model are available in Román Díaz’s book – #3 Origami Essence. The book is incredible and will make a good Origami book collection. There are many models to fold from this book for all levels of complexity.